If you are wondering how to grow mint, its simple. Mint is one of the best herbs to grow. Mint is easy care and in fact can become a bit of weed if let go. We tend to grow mint plants in pots or other ‘contained areas’. However it is of great value in the herb garden, so when it roams a little, just pull it up. Growing mint in pots or containers, (see picture right) or in an ‘enclosed’ garden bed where it can not roam is one idea, but in pots you can more easily find a spot that happens to be close to the kitchen, easy for picking. Mint grows well in pots, and this may be the best way of taming its spreading nature. It is a herb that is used extensively in Middle Eastern and Indian cooking. Mint is very easy to propagate and grow from cuttings. You can simply take cuttings that are around 15 cm long, strip the leaves from the lower 1/2 and sit these in some water until new roots appear. As soon as the roots appear, you can plant the cuttings into a container. Use a container that is fairly wide and not necessarily deep. Remember that mint is an invasive plant, so container growing is the best option. The root system is vigorous and will send up new shoots regularly. It will grow in the container for 2 -3 years, after this it will need repotting. Best grown in partial shade rather than full sun. Every year you will need to prune the mint plant to keep it productive. You can usually find some healthy small plants in a container each year. Simply remove these and plant them in a new container with fresh potting mix with some perlite mixed through it. Growing mint should really be problem free, however many gardeners do have problems. A well drained humus rich, moist soil is all that mint requires, or so the story goes. In general mint likes a cool moist root run, yet plenty of filtered light, and it also likes a fairly constant environment. We are looking for a humus rich moist deep soil, but well drained, filtered light but not deep shade. A light soil, not a clay type. Growing in a container or pot requires a largish one, mint has a root system that like to have a little room, it is a bit of a roaming plant so give it space. Moisture needs to be constant, so use a specialist terra-cotta and tub mix with some added water retention crystals. Growing mint in warmer climates can cause problems, it does require constant moisture, in Queensland try growing mint in morning sun and shade from midday on. Remember that in cooler areas plants will die back in winter, but will bounce back in spring. Generally not to many pests to worry about. How To Prune, Feed and rejuvenate Mint plants to encourage healthy growth. Although mint is easy to grow and in fact is fast growing it does require annual care to keep it productive. Most mint is grown in pots or containers, and this is how we rejuvenate our mint plants. Simply pruning mint back and adding a little fertiliser is not enough. Mint produces masses of roots, and for best results it is best to dig the plant out. Divide the mint, replenish the potting mix with some well rotted compost and perhaps some vermicast, and then replant some sections of the mint. If you tip prune your mint through the growing season, and water it every few weeks with a liquid seaweed fertiliser it will remain healthy and productive. Remember to pick out the flower buds as they appear. Also remember that mint grows best in afternoon shade in all but the coolest zones. Mint can be used in many recipes, it can also be used in spaces as well as in drinks such as iced tea. 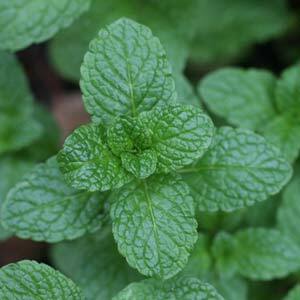 Mint plants are a herb with many varieties that are easily grown in pots or in the home garden. The most common mint variety grown is M. spicata or Spearmint, it is used widely in cooking, for sauces, salads and mint jellies. Apple mint, Pineapple Mint and Peppermint are other popular species. And then we have the sub species such as Mentha x piperita f. citrata ‘Chocolate’, yes it has a ‘chocolate’ taste to it.